They have been with you through the good times and the bad. Maybe through a few pints of Chunky Monkey ice cream, the minutes before adopting the cutest kitten ever, or that painful half-marathon when you are starting to get a cold. However your friendship bonded, those ladies (and even gents!) are now going to be standing with you as you start the next big chapter of your life with your forever partner, so it's only natural that you would want to spoil them in small and big ways to say thanks. So in partnership with POPSUGAR Must Have Box, we've rounded up our favorite ways to spoil your besties during your engagement. No matter if they are near or far, it's all about showing some extra love for your wedding support system! From pastel hues to pool parties to brunch menus to lunch by the waterside, whatever the theme is, bring your wedding party together for a non-bridal shower or wedding-related luncheon and have a little fun with your theme and your squad. Be sure to communicate the theme ahead of time, especially if it involves a costume or color-specific outfit! Some of our favorite themes have been preppy chic, trendy flamingos, and giant inflatable pool floaties. Possibilities are endless, but any time spent together is a great one. 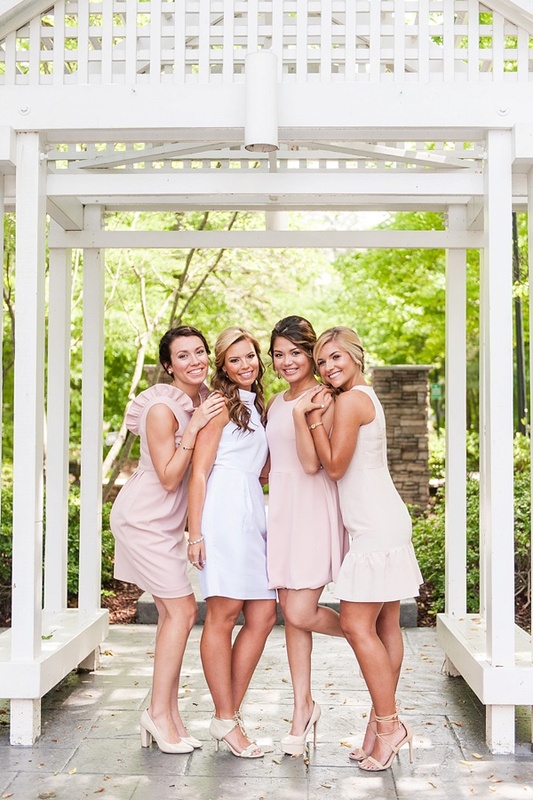 Photography: Amber Kay Photography | Venue: The Boathouse at Sunday Park | Wedding Coordination: Alana Futcher of Chancey Charm Richmond | Hair and Makeup: Transformations Artistry | Bridesmaid Dresses: Camilyn Beth Bridal | See more of this Pastel-Themed Bridal Luncheon. Who doesn't love some good mail that's not a bill?! Sending surprises is always a great way to spoil your BFFs, and one of our favorite monthly subscription boxes is the POPSUGAR Must Have Box. Thoughtfully curated with monthly themes, each box has a little something for everyone. From beauty, to home, to snacks, to fashion, there's always something to get excited about when gifting these to your gals. Fun Fact: The POPSUGAR Must Have Box is turning 5 this year, and we're celebrating with them by way of this feature because their inspiration was "Celebrate. Gratitude. Loyalty. Smile. Friendship." All perfect descriptions for your own wedding squad! POPSUGAR is doing a ton of giveaways this month in celebration of their birthday, so be sure to get in on the fun by becoming a subscriber! It just means more gifts to give to your wedding party! First it was food trucks, but now there are spas on wheels (like Dove and Daisy Spa in Virginia Beach)! Rent a mobile spa for the afternoon and invite all of your ladies for massages, manicures, pedicures, or any other spa treatment that's offered. It's such a low stress get together that will guarantee the "I appreciate being spoiled!" factor. So no matter where you are, bring the spa to you. Consider finding a local park and having a picnic just outside the RV as well. It'll definitely be a weekend afternoon well spent. Photography: Andrew and Tianna Photography | Mobile Spa: Dove and Daisy Spa | Learn more about the Virginia Beach mobile spa goodness. Cheers to friendship! There are so many ways to personalize wedding day gifts depending on your personality and your friends' styles. 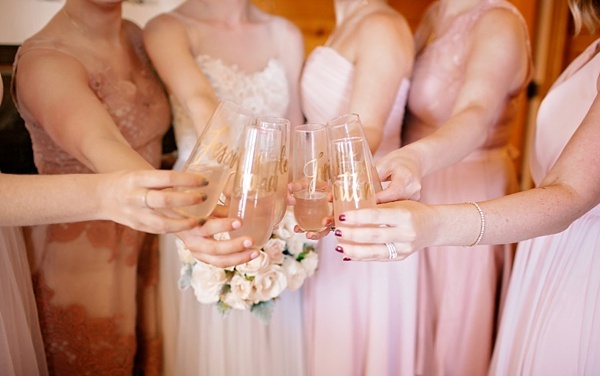 From monogrammed t-shirts, tote bags, to jewelry, anything that makes it extra special for that bridesmaid is sure to make her feel extra loved. Photography and Gold Personalized Stemless Champagne Glasses: Style Dahlia via Etsy | See more Personalized Bridesmaid Gift Ideas. What if you and your crew are a bunch of crafty masters? 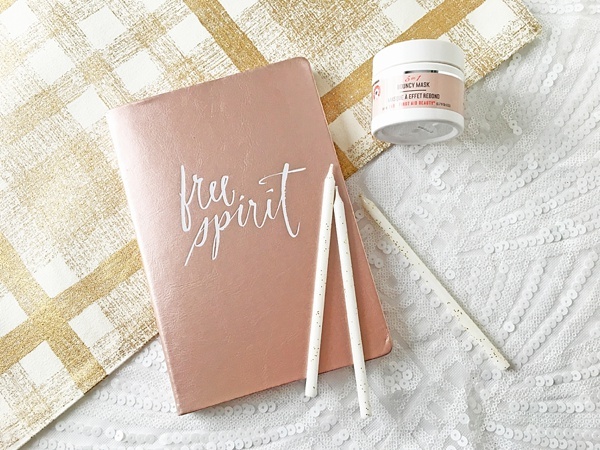 Plan a chic crafternoon that's a little different than the average scrapbooking or paper cutting. Consider alternative creative projects like DIY Flower Crowns, DIY candles, or even DIY lip balms. Chances are it's all a little outside everyone's skill set, so it'll be something new as you make some fun treats and memories together! 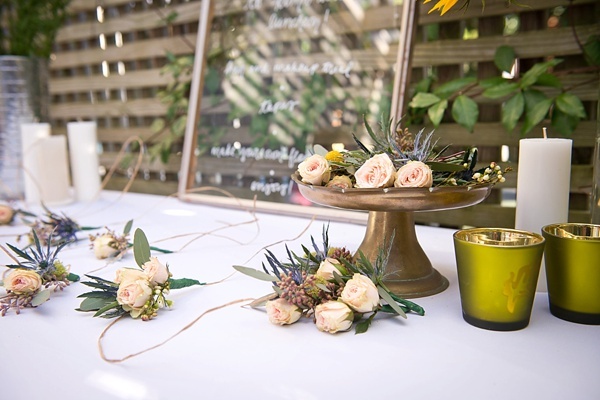 Photography: GingerSnaps Photography | Venue: 108 Budleigh | Event Coordination, Styling, and Handlettering: Heart of Harlow | Florals: Flower Girls OBX | Boutique Rentals: Renee Landry Events | See more of this DIY Flower Crown get-together. What are some ways you're spoiled your wedding party? Share with us on our social media channels! Many thanks to POPSUGAR for partnering with Tidewater and Tulle for this fun bridesmaid gift idea feature! And while the disclaimer is that we were sponsored to write this, the words, personal experience, and our loyal love for POPSUGAR are all our own. You can find our full disclosure policy here.